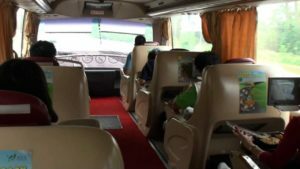 With hundreds of buses leaving from various points in Kuala Lumpur to many locations in Singapore, travelling by bus is the most commodious, comfortable and cheapest method to arrive at Singapore from KL, Malaysia. The travel by bus approximately takes 5-7 hours or less and depends on many factors like Traffic, blocks etc. There are many pick-up points of buses in Kuala Lumpur like KL’s Puduraya or KL Sentral bus terminal and many other drop-off points in Singapore like Golden Mile complex, Harbor Front Centre and Novena Square making it highly convenient for the passenger to get in and get out at his most appropriate location. On the other hand, going to Kuala Lumpur international airport from Kuala Lumpur city takes about 1 hour drive. In addition to this, the check-in time for buses are normally 30 minutes before departure whereas for airlines, the check-in time usually 2 hours. Considering the time to arrive at airport and check-in time of airlines, most people travel by bus from KL to Singapore. The-state-of-the-art modern buses come with all luxury and features which would comfort its passengers during the entire journey. Modern buses and coaches come with fully reclining seats, air-conditioning, adequate lighting, and even toilets. Some Bus operators also provide Wi-Fi and TV equipment for a fun filled environment throughout the trip. Some of these bus operators include KKKL, Grassland Royal VIP, Fivestar High Deck, Luxury Coach, Transtar Solitaire, First Coach, Odyssey, Nice Imperial and Aeroline. There are many Deprture points with different coach operators at Kuala Lumpur and passengers can choose the most suitable one they want and start their awaited journey. This is the most popular reason why passengers prefer to travel by bus from KL to Singapore. i) From Terminal Bersepadu Selatan (TBS) KL – Eltabina, Causeway Link, Sri Maju, Qistna Express and Konsortium. ii) FromBerjaya Times Square KL – Grassland, KKKL, Luxury Coach, Transtar, Fivestars, WTS and Starmart. iii) From Pudu Sentral (Puduraya) KL – Alisan golden Coach and Transtar. iv) From Terminal KTM Old Railway Station KL – Transnasional, Nice and Plusliner, from Chinatown (Petaling Street) KL –KKKL. v) From One Utama KL – Transtar, Fivestars, BillionStar, First Coach and Aeroline. vi) From Bangsar KL – First Coach. vii) From Subang Jaya KL – First Coach. viii) From Sunway KL – WTS and Aeroline. ix) From Mont Kiara KL – Odyssey, etc. Most Buses or coaches drop their passenger at various drop-off points in Singapore including Beach Road, Golden Mile Complex, Novena, Jalan Sultan, Marine Parade Katong V, Harbor Front, etc. Many Coach Operators provide a direct routing to Singapore without any break except for a single washroom break or washroom and meal break. Therefore, Passengers have to pick the appropriate ticket they want to reach Singapore from KL. The pricing of the ticket ranges from 45 Malaysian Ringgit to 100 Malaysian Ringgit (20 Singapore Dollars to 45 Singapore Dollars) and depends on the class the passenger wants. A standard Fare usually costs 50 Malaysian Ringgit or 30 Singapore Dollars.